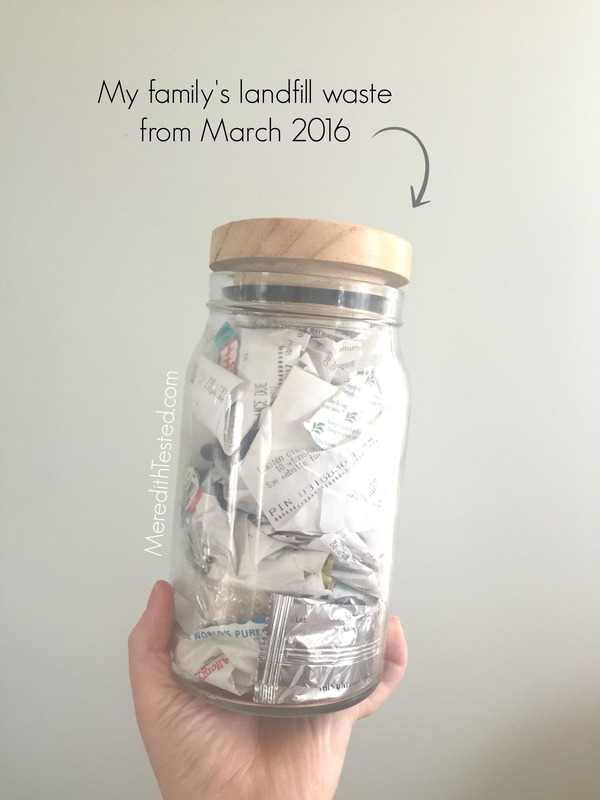 Three months of living with a focus on reducing our landfill waste on the books! We still have a lot to learn and we’re still tweaking our different systems, but in general this lifestyle works for us. Here are some random thoughts and musings I’ve jotted down this month. If there’s anything specific you want to know, please leave me a comment or email me (meredithtested@gmail.com) and I’ll do my best to cover it in a future post. The thing that shocks me still is how many “pre zero waste” things we’re still working through and have yet to have to find (or try) the zero waste or less-waste alternative for. Our last tube of toothpaste is still going strong, for example. Possibly because we’re just noticing our consumption of everything and using less? We still have some shampoo and conditioner in a bottle left, but I cracked into my shampoo bar about a month ago anyway. Shampoo bars are a revelation. I was nervous that it would be like a body soap. But it’s not – the one we’re using has a lovely lather and cleans my hair really well. In fact, I think my hair is healthier and shinier now. We’re still using conditioner at home since we have a bottle but while traveling I was just using the shampoo bar and then running a tiny bit of Argan oil through my ends and it worked well. We’re still working through our big bottle of liquid laundry detergent but I’m going to be trying out a purchased zero-waste option soon. And then I’ll try a DIY version. I will not be changing our cloth diaper laundry routine. Our current routine really works for us right now so I don’t want to mess with it too much by trying a new detergent, etc. Perhaps I’ll do some experimentation but what we do now is easy and works well for us. My daughter will only be in diapers for another year+ so maybe we’ll just stick with the not-perfectly-zero-waste system that works for us. At least the packaging is recyclable. I’m hysterically terrible at my zero waste “elevator pitch.” It’s ironic since I talk and write for my job (PR). My husband thinks its because it’s so …BIG… to me. And I’m a little anxious about seeming like I’m being preachy. So I just kind of falter and stumble around. I’m so incredibly passionate about living this way. But, it’s a lot to talk about, especially given the fact that most households throw out a bag or more of trash a week, and now we’re only producing a jar a month. It’s hard to condense the changes we’ve made into a few sentences. However, I think this is important as more and more people challenge themselves to reduce landfill trash. So, I’m working through a few elevator pitches and I’ll share them with you soon. Challenging the status quo isn’t as scary as it once seemed to me. I tend to be passionate about the things I believe in but even so, it was a little intimidating to think about constantly “butting up against” wasteful practices and trying to change consumption habits. Starting small has been helpful. I’ve kind of made it a routine to reach out to local businesses and restaurants after I visit to suggest more eco-friendly practices such as not auto-printing receipts or automatically handing out plastic straws. I may not always get a response, but the responses I have gotten have been positive. Mostly along the lines of “Huh, good idea, we just always did it this way and never thought to change.” I feel the same way, actually! I used to accept so many single-use disposable items into my life before without thinking. Now that I know the alternatives and know how easy it is to reduce my waste, it’s second nature to refuse. But it isn’t second nature to many people and businesses. And that’s okay! You don’t know what you don’t know, right? I don’t think I could ever go back to buying packaged food. The only thing we really “miss” is the occasional bag of chips. But even then, I’m not sure the taste or experience will be that exiting. So many zero waste things are second nature now, I forget to post about them, even. Many of the changes we’ve made took so little time and effort to adopt. It’s not that I can’t remember what it was like to have paper towels or other typical single-use household items, but our lives just aren’t really impacted at all by the zero-waste counterparts. It’s boring, but true. I’m having a hard time convincing certain people that I am not judging their choices or being judgmental. I am just living my life and trying something out. If I’m on a diet and you’re not, that’s okay with me. If I’m on a diet and you’re not and it makes you feel guilty, that is frustrating but I don’t know how to help. I’m not sure how me guilty for making someone feel guilty is that productive, if that makes sense. Either you’re confident and comfortable with your choices or you’re not. I am certainly not always comfortable with my choices but I am just trying to live a life I am happy with and that I can sustain for a long time. A huge portion of the jar was taken up by two plastic shipping sleeves. We got a cloth diaper and my husband got a pair of nice commuter biking pants. The rest is receipts and produce stickers, etc. There are other random things like the packaging for my dog’s medicine, bits of plastic that can’t be recycled in my area like smaller bottle caps. One thing I’m really excited to share is that after sending a quick email, the main health food store where I do most of my grocery shopping will be changing their point-of-sale/register system so that it doesn’t automatically print receipts. I’m not sure if the change has taken place yet but I will update you when I know more. UPDATE 3/11/16 5:00pm EST: I meant to disclose/share that this jar does not include a few pieces of trash we accumulated during the last few days of March while we were visiting family in California. A couple straws we couldn’t refuse fast enough and trash from In and Out burger. We did our best to take as few single-use/non-compostable items as we could but my when my husband wanted a shake, I didn’t argue. I’m not the garbage police, that would be exhausting. He asked for it without a lid or straw and used a straw we brought, but the cup was discarded. We also got a paper container during a (delicious) trip to a taquiera in Palo Alto, which I shared on Instagram. I’m pretty sure if I had brought all the trash back with me I could’ve made it fit in the jar, but I wasn’t about to carry garbage around with me on our trip. I’m not perfect! Please ask me any questions you might have in the comments (or email meredithtested@gmail.com) I’ll do my best to answer here on the blog or on Instagram. Admittedly, I sometimes feel guilty when I see that my family produces more trash in a day than yours does in a month but more often I feel inspired to try to make small changes in our lifestyle and I never feel judged. Your posts are always encouraging and never judgmental or preachy. I have a question and I hope this is the right place for it. I use paper towels to clean my cast iron pans. I can’t use cloth because I can’t clean it either in the sink or the washer. (Don’t put grease down the drain) ideas? Great question! I just posted my cast iron cleaning technique on Instagram.com/MeredithTested. I heat & pour any oils into a jar (which goes in the fridge until its full and eventually gets scooped into the compost). Then I use hot water + an old scrub brush head. Works beautifully! Thanks! That’s what my grandma did, except she would use an old coffee can and reuse the oil (animal fat). Yuck! Every one seemed to like it at the time. But I don’t think I could do what she did, lol. You helped me get one step closer to being zero waste. Thanks! Your grandma sounds rad! 😉 And glad you asked! Happy to help. Sometimes I forget to mention things bc it’s so normal to me now. I rely on reader questions to remind me to post this kind of info. 😁 happy to help/get help!